Ultimately, this snippet is a sizzle reel. A condensed version of the two excellent trailers that we’ve already seen. And yet, even in such a short period of time, the footage bleeds with Snyder’s sense of style. What’s more, with Christopher Nolan and David S. Goyer acting as Man of Steel’s creative producer and screenwriter, respectively, the trailers reflect their compelling talent for storytelling. The angle taken by the film seems to be in keeping with Nolan’s The Dark Knight Trilogy and, in truth, we’ve all heard the adjectives gritty, realistic and authentic used ad nauseum in recent times. In saying that, Goyer’s script is portraying the last son of Krypton as an alien trying to assimilate with our earthly society, which, to me, is a fascinating perspective, especially how Superman is, in his comic book essence, an invincible superhero. It lends a sense of depth and vulnerability to the main character and I’m hoping this is a theme that Snyder and his creative team fittingly execute in the finalised film. 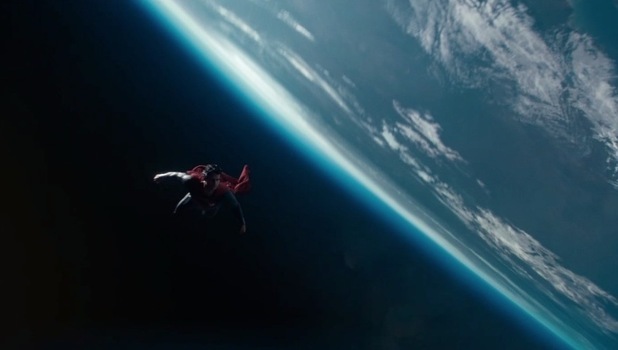 At its extraterrestrial core, Man of Steel is an origin story through and through. With Marvel holding the lion’s share of the global superhero audience following The Avengers in 2012, Warner Bros. will be hoping that Zack Snyder’s film can establish the studio’s own foothold in the cinematic calendar and ignite excitement for the DC comic book canon in the absence of Batman – a feat they admittedly fumbled with The Green Lantern. With Henry Cavill taking centre stage as Clark Kent, the film also stars Amy Adams as Lois Lane and Michael Shannon as General Zod. Rounding off the impressive cast list include Russell Crowe, Kevin Costner, Diane Lane and Laurence Fishburne. After watching the clip umpteen times, there’s only one question on our minds, is it June yet? Man of Steel will be released in theatres June 14th. What do you make of the footage thus far? Is it a film you’ll be rushing out to see? Let us know!